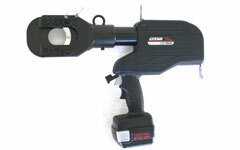 LIC-S540 Battery Operated Cutter Lithium Ion Tools: Izumi Products. The LIC-S540 has twin stage hydraulics for rapid ram advance. With the pull of the trigger, you can cut ACSR conductors up to 40mm, guy wires to 20mm, wire ropes to 22mm and ground rod to 16mm. 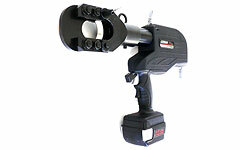 The LIC-S540 has an overload bypass which will "kick out" when the tool reaches 7 tons of output. Shoulder strap, BP-14LN, CH-25LNW, Double moulded carrying case.